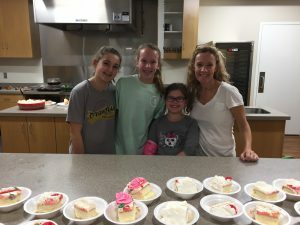 We recognize volunteers as partners in our mission who make our House a home daily through meals, activities, and hard work in-house through cleaning, organizing, administrative tasks, marketing tasks, family programming tasks, and more. 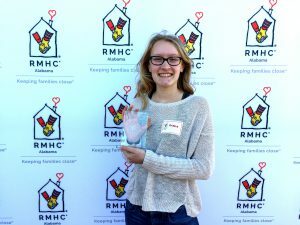 Along with leadership teams such as our Board of Directors, Junior Board, and Student Leadership Council, we have made such a huge difference in the lives of RMHCA families. 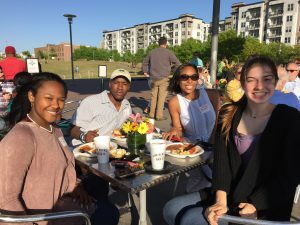 To thank our volunteers, we held our annual Volunteer Appreciation dinner on Tuesday, April 17. 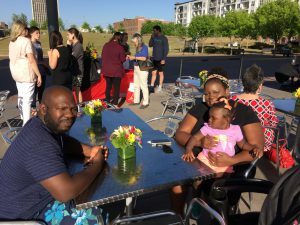 They enjoyed a barbecue dinner from Jim ‘N Nicks and beautiful flower arrangements from Norton’s Florist. 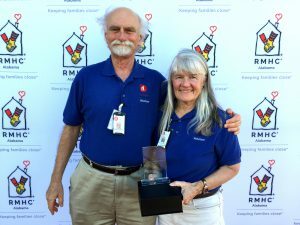 RMHCA is so grateful to every volunteer who gives selflessly of their time and talents! Here are some fun facts about all their hard work. As is our tradition, we also honored some of our most outstanding volunteers at the dinner. Meet them below! The Volunteer of the Year Award goes to someone who stands out amongst the staff as a leader that is always willing to support our mission through volunteerism. Tim Sanford reaches out consistently to see what needs we have and how he can address them. He has volunteered with us at special events and through our meal program. With involvement in many other groups, he has been a wonderful advocate for the Ronald McDonald House. He has committed his time in many areas with a smile always on his face. Aaron Fobian poses with her volunteer award. This year it was an easy choice for Young Professional of the Year. 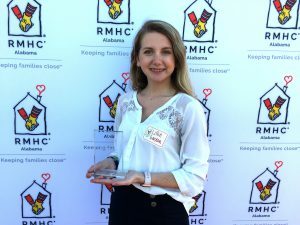 Aaron Fobian not only agreed to take on one of the RMHCA Junior Board Signature Events, she also brought a brand-new hip idea that had lots of potential in the Birmingham area. The Red Carpet Rendezvous was the first ever date auction event held in Birmingham. It was a huge success thanks to all of her hard work and dedication for over a year. 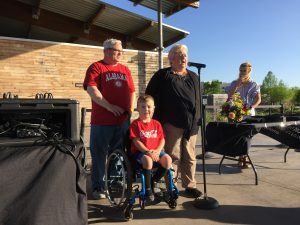 With her tenacity and her “not taking no for an answer” determination, she was able to recruit the right stars for the live auction, while securing incredible “experience” type auction items that exceeded our expectations. This event was a huge success and raised almost $35,000! 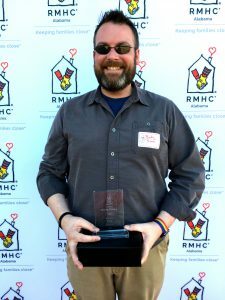 “I love volunteering for the Ronald McDonald House because the families are so blessed and when your child is in the hospital there’s not anything better than being able to know you have a place to go home to, near where your child’s healthcare is and being able to get back to them,” Aaron said. Ariana White poses with her award. The Youth Volunteer of the Year Award is presented to a volunteer under the age of 18 who has shown great commitment and diligence in their volunteer work. Ariana has completed over 60+ hours of community service for the Ronald McDonald House. She has served on our Student Leadership Council as Volunteer Coordinator, participated in events, and volunteers at the House regularly. Ariana goes above and beyond to help out where needed. 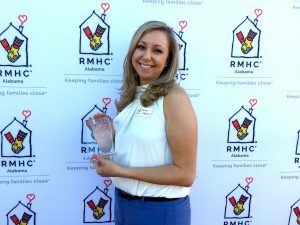 “I aboslutely love volunteering with the Ronald McDonald House because their mission of keeping families close, especially when their kids are going through something monumental, whether it’s cancer or some other condition. I really love working with kids and being able to give back in any way I can, especially within my community,” Ariana said. Jake shows off the Dynamic Duo Award. The Volunteer Duo of the Year Award goes to two volunteers who have cultivated the vision of the Volunteer Program: to serve and have fun while doing it. Jake Clark and Alex Hill have volunteered together to make our House a better place. These two have stepped in and helped in areas that no one else wants to (aka cleanup crew). However, with good attitudes and a heart to serve they have made every job easier. It is friends like these two that make our program so much fun. Through volunteering at the House and at Special Events, Jake and Alex are always offering an extra hand. 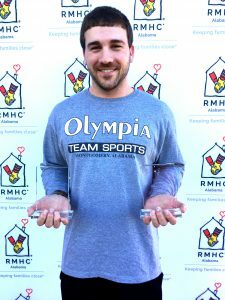 “Myself and Alex Hill love coming to the Ronald McDonald House because it’s a humbling experience and we just love being with the kids and hang out and see the smiles on their faces,” Jake said. The Special Events Enthusiast Award goes to a volunteer that helps execute our special events. Our events would not be possible without our volunteers who assist with the Red Shoe Run, Ronld McDonald House Golf Classic Tournament, and Heart of the House Gala. This volunteer has put in hours of hard work and always with a smile on her face. Maranda continues to come back year after year to make our events a success! She has recently joined our meal program as well continuing to support our other programs. Andy and Ruth Ann Peters. The Happy Wheel’s Program started in January 2016. 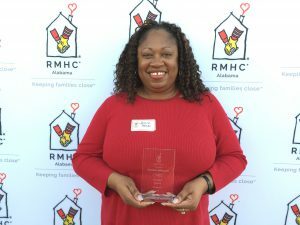 This program takes place in Children’s of Alabama staffed by Ronald McDonald House volunteers. These volunteers give out snacks, waters, and art activities to the patients and families in clinics 14 and 15. Andy and Ruth Ann are two volunteers who we could not live without. They volunteer in every area of our House, but absolutely thrive within our Happy Wheels Program. They are a breath of fresh air and are always open arms to assist where needed. We will continue to be forever grateful for their 400+ hours of service to the House. The Kitchen Queen/King Award goes to two people that have consistently made our kitchens a better place. Just like at your home, we strive to make our kitchens the heart of our House, filling them with yummy food, hospitable people, and a loving atmosphere. And these two recipients have done just that. Our Kitchen Queen Jessina has continued to volunteer at our House regularly making sure our kitchens are clean, organized, and ready for our families and meal groups. She has completed more than 200 hours of service. Our Kitchen King Rocky is a long time meal program volunteer who absolutely makes the BEST cakes. He travels from Montgomery to cook fabulous meals for our families, while making them feel loved and definitely full. He has completed more than 100 hours of service and we are so thankful to have him on board. “The thing I enjoy about feeding the families at the Ronald McDonald House is providing a quality meal and nutrition for these families, knowing what they’re going through on a daily basis and knowing that we’re giving them a hot meal to come to at the end of the day,” Rocky said. The Rengering family making dinner in February 2018. The Super Supper Club Award goes to a meal group that has shown great commitment to our meal program. The Rengering family has been with us for more than five years, accumulating more than 300 hours of service. They provide a meal once a month for our families, never failing to show up. What makes this group so special is that it is a family. They have a daughter involved on our Student Leadership Council and make our meal program a priority. We love the generosity the Rengering family brings to the House! Lillie Gaston from Helena UMC. The Church Group of the Year Award goes to a church group that has been with us for more than years providing meals and activities for our families. The generosity and dedication from Helena United Methodist Church has continued to make our House a better place. They consistently stay on our calendar to volunteer in our different programs. Dinner and Bingo Night is a family favorite hosted by them. 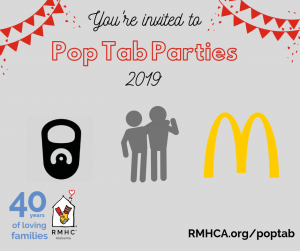 The Ronald McDonald House has many church organizations involved and on board with our mission, so we could not do it without them. “I love volunteering at the Ronald McDonald House because I love seeing the smiles on all the families’ faces. I enjoy serving them and giving them an activity they enjoy, like bingo, and seeing their smiles and laughter,” Lillie said. The Family Activity Favorite recipient, Hand in Paw, is a wonderful program that has continued to bless our families. The joy and energy that not only the animals bring, but staff as well makes this program so amazing. 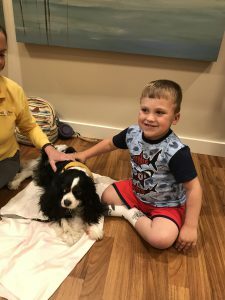 They come twice a month to our House to bring comfort, and happiness through Animal-Assisted Therapy. This is absolutely a highlight for our guest families. Thank you so much to Hand in Paw for being wonderful Family Activity partners with our House! L-R: Samford ADPi members Macy Murray, Mary Beth Wagner and Macy Marin. All of our ADPi chapters are so special to us! It is always such a joy for our staff to work with these girls that give so much to our mission and organization all year long. 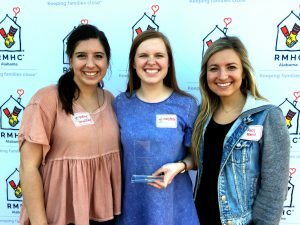 This year, our ADPi Chapter of the Year not only put on amazing fundraisers – they were also an incredible help to us during the Grand Opening of the East Wing Expansion, and have provided several meals and activities for our guest families. The Samford University chapter of ADPi took on an exciting new event in the fall, and even broke a fundraising record at their school in the process. Over the last 12 months, these girls have raised over $51,000 for RMHCA.